At Mark E. Richardson, DDS we offer non-traditional Invisible Braces called Clear Correct. These braces would be for the patient who desires straighter and whiter teeth, which will promote a greater self-confidence and self-esteem. Dental implants are the most innovative, revolutionary method to replace missing teeth. They can replace a single or multiple missing teeth and they can also support a removable appliance like a denture or a partial. Welcome! Since 1992, Mark E. Richardson DDS has been working with patients to provide the best dental care in the Kalamazoo area. Dr. Mark E. Richardson's experience in dentistry is coupled with genuine concern for his patients. All our staff is dedicated to your comfort and prompt attention as well. Our goal is to keep your teeth healthy and your smile bright. This web site provides you with an overview of our practice and the field of dentistry. 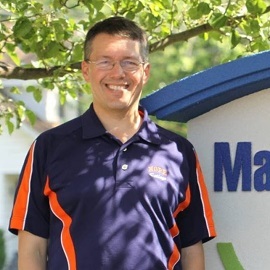 As you navigate the site, you'll find information about Mark E. Richardson DDS practice philosophy, our Kalamazoo dental office location, insurance policies,our staff, and appointment scheduling procedures. Please browse the site at your convenience and feel free to contact us with any questions. You can also request an appointment by clicking here. You'll find a lot of valuable information on the web site about dental problems, diagnoses and treatments. We believe informed patients are better prepared to make decisions about their health and well being. We encourage you to review this information to help you understand any health concerns you may face. Also, please watch our web site for any specials that we are currently running. Dr. Richardson was born and raised in Kalamazoo, MI. He is a second generation dentist. After graduating from Kalamazoo Central High School he obtained his Bachelor of Science degree at Hope College with a major in Biology and minor in Religion. "...We are thrilled to have him as our new Dentist! The staff is incredibly kind and knowledgeable...Dr. Richardson went above and beyond what any of our past dentists have..."
"Dr. Mark and his staff were awesome with our 3 1/2-year-old today in her first dentist visit. So glad we chose this practice for our daughter!" "The Richardson's have been taking care of my teeth since I was a boy and now Dr. Mark is taking care of my family. Dr. Mark is a good man and a great dentist."